One part Johnny Depp, one part rum, mix well, and you've got The Rum Diary! Oh wait, Johnny Depp isn't one part of this mix? It's actually "outrage"? Not as good, I say! Yahoo has debuted the first official teaser poster for The Rum Diary, the latest Hunter S. Thompson novel adaptation starring Johnny Depp and Aaron Eckhart and Amber Heard, directed by Bruce Robinson. We finally got to see a trailer for this film last week and it looks as wacky and alcohol-filled as any Hunter S. Thompson story should be. I really think it's a great poster, just a simple but smart and effective design for this particular story. Check this out! 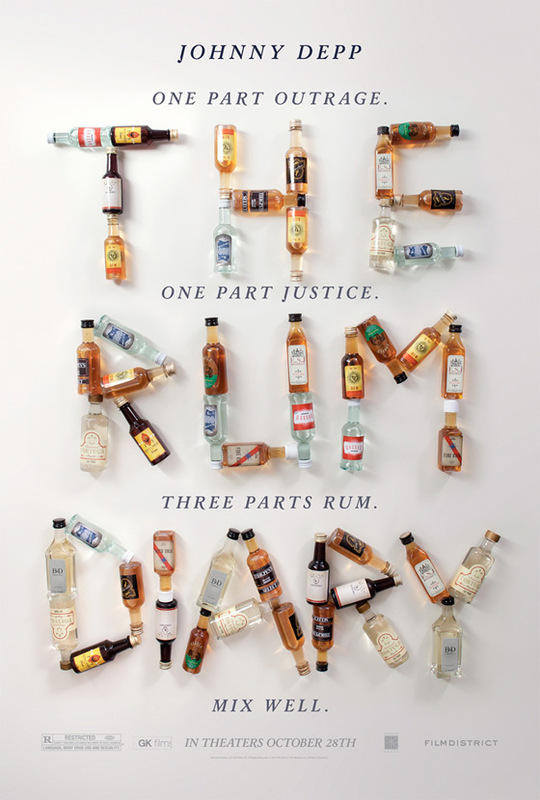 Based on Hunter S. Thompson's novel, The Rum Diary, directed by Bruce Robinson (Withnail & I), follows Depp as Paul Kemp, a divorced alcoholic and struggling novelist who decides to "kick around" in San Juan until his ship comes in, working as a journalist for a newspaper that's on its last legs, drinking "gallons of rum" and experimenting with LSD. With his new friend Bob Sala by his side, Kemp becomes entangled in a corrupt hotel development scheme with a PR consultant named Sanderson. After quite a delay, FilmDistrict will finally be releasing The Rum Diary in theaters starting October 28th this fall. Planning on seeing it? Rum is easy to drink, compared say, to whiskey, I quite enjoy it with a ginger beer and a slice of lime. I suspect the designer never drank the contents of these bottles befoe the shoot or it probably would have said 'HET MRU YIARD'.